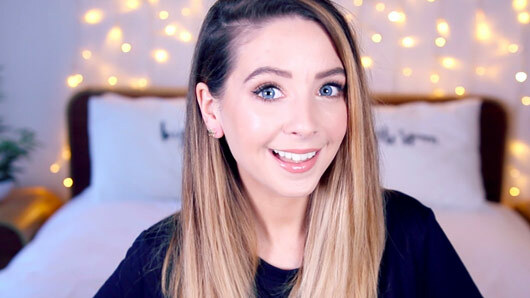 YouTube sensation Zoella has apologised after some of her old, offensive tweets emerged online today. 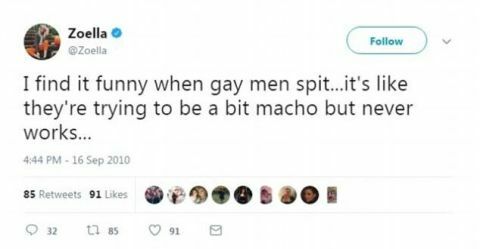 The tweets in question were posted seven/eight years ago and mocked gay men, “chavs” and “skanks”, and have since been deleted by the star. Another tweet saw the YouTuber label a contestant on The X Factor a “fat chav”. After screenshots of her remarks began circulating on the internet, Zoella deleted her old posts and shared an explanation online. “I’ve seen a few of my old tweets from 7/8 years ago floating around (which I have now deleted) using words like ‘chav’, ‘skank’ and other words I wouldn’t use now as part of my language and lot of them were taken out of context referring to TV shows,” she wrote. Zoella has already been the subject of criticism this week after customers started complaining the contents of her £50 2017 advent calendar were not worth the heavy price tag. Boots has responded to the criticism by announcing they’ll be selling the Christmas calendar for half the price, meaning it’ll be on sale for £25 as of tomorrow (November 16). YouTube has amended its ‘Restricted Mode’ guidelines after an outcry from LGBTQ content creators. The platform has now unblocked over 12 million videos “including hundreds of thousands featuring LGBTQ content” after creators criticised YouTube for restricting their voice. The ‘Restricted Mode’ was originally put in place to filter out “mature content” in libraries and schools, but ended up blocking access to a whole host of LGBTQ videos due to trigger words such as “gay”, “lesbian” and “bisexual”. Popular YouTubers such as Tyler Oakley, Tegan and Sara and Gigi Gorgeous publicly criticised the site in videos and on other social media platforms. She continued to explain how guidelines have now changed so that “non-graphic, personal accounts of difficult events are available” as long as they don’t contain graphic language. The blog post also emphasised YouTube’s commitment to the LGBTQ community, mentioning upcoming events and programmes such as the fifth annual #ProudToBe campaign celebrating gay pride. Wojcicki concluded that YouTube should “remain a place where LGBTQ people and their families, friends and supporters can express themselves, empower others and find a place to belong”. 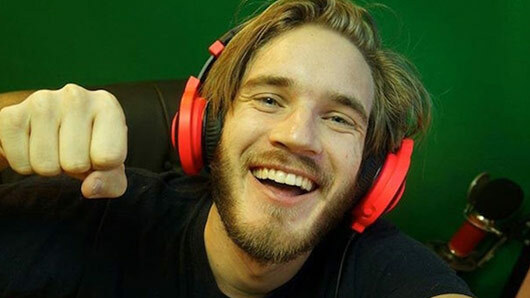 Disney have decided to end their partnership with YouTube star PewDiePie after he was accused of posting anti-Semitic content on his channel. Felix Kiellberg rose to fame on YouTube as PewDiePie, originally making comedy gaming videos. Now one of the biggest content creators in the game, Felix now has over 53 subscribers and even teamed up with Disney’s Maker Studios in 2014 to produce mobile apps and merchandise. However, Disney have now parted ways with the Swedish star following controversial content posted in January. According to The Wall Street Journal, PewDiePie uploaded a number of offensive videos last month, one of which included two Indians holding up a sign reading: “Death to all Jews”. Maker Studios said in a statement: “Although Felix has created a following by being provocative and irreverent, he clearly went too far in this case and the resulting videos are inappropriate. Felix later shared a Tumblr blog post to “clear some things up”. He wrote: “I was trying to show how crazy the modern world is, specifically some of the services available online. “I think it’s important to say something and I want to make one thing clear: I am in no way supporting any kind of hateful attitudes. “I make videos for my audience. I think of the content that I create as entertainment, and not a place for any serious political commentary. I know my audience understand that and that is why they come to my channel. “Though this was not my intention, I understand that these jokes were ultimately offensive.